Ricky Thomas Ponting, AO , nicknamed Punter, is an Australian former cricketer who was captain of the Australia national cricket team during its 'golden era'; between 2004 and 2011 in Test cricket and 2002 and 2011 in One Day International cricket. He is a specialist right-handed batsman, slips and close catching fielder, as well as a very occasional bowler. 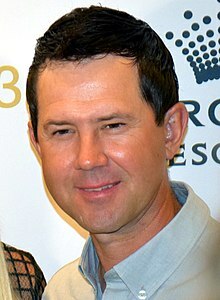 Ponting holds the record of being the only cricketer in the history of Test cricket to be a part of 100 Test match wins. He was named "Cricketer of the decade 2000". He led Australia to victory at the 2003 and 2007 Cricket World Cups and was also a member of the 1999 World Cup winning team under Steve Waugh. Ricky Thomas Ponting, AO (born 19 December 1974), nicknamed Punter, is an Australian former cricketer who was captain of the Australia national cricket team during its 'golden era'; between 2004 and 2011 in Test cricket and 2002 and 2011 in One Day International cricket. He is a specialist right-handed batsman, slips and close catching fielder, as well as a very occasional bowler. Ponting holds the record of being the only cricketer in the history of Test cricket to be a part of 100 Test match wins. He was named "Cricketer of the decade 2000". He led Australia to victory at the 2003 and 2007 Cricket World Cups and was also a member of the 1999 World Cup winning team under Steve Waugh. He represented the Tasmanian Tigers in Australian domestic cricket, the Hobart Hurricanes in Australia's domestic T20 competition the Big Bash League, and played in the Indian Premier League with the Kolkata Knight Riders in 2008. He is widely considered by many to be one of the best batsmen of the modern era, alongside Sachin Tendulkar of India and Brian Lara of the West Indies. On 1 December 2006, he reached the highest rating achieved by a Test batsman in the last 50 years. After being involved in over 160 Tests and 370 ODIs, Ponting is Australia's leading run-scorer in Test and ODI cricket. He is one of only four players (along with Sachin Tendulkar, Rahul Dravid and Jacques Kallis) in history to have scored 13,000 Test runs. Statistically, he is one of the most successful captains of all time, with 48 victories in 77 Tests between 2004 and 31 December 2010. As a player, Ponting is the only cricketer in history to be involved in 100 Test victories. Ponting also holds the record to have been involved in the most ODI victories as a player, with 262 wins. On 29 November 2012 Ponting announced his retirement from Test cricket, the day before he would play in the Perth Test against South Africa. This was his 168th and last Test appearance, equalling the Australian record held by Steve Waugh. Ponting retired on 3 December 2012 with a Test batting average of 51.85. He continued to play cricket around the world. In February 2013 it was announced that he would be captaining the Mumbai Indians team in the Indian Premier League. and in March 2013 he was announced as the first international franchise player for the Caribbean Premier League. Later that month it was revealed by Ponting that this would be his last season playing cricket, as at the end of the competition he would be retiring from all forms of the game. Find out more at ecb.co.uk A classic captain's knock. With backs against the wall, Ponting stood tall and carried his side, if not over the line, very close to it. 6666666 in a row, Ricky Ponting in India, unbelieveable hitting. Shahid Afridi WHO? Sachin Tendulkar WHO? Are these guys cricketers or 7 ****** employees??? ?